This large stone building on Chesterfield Road was first known as the Poplar Cottage Hydropathic Establishment, trading as Thomas Davis and Sons. 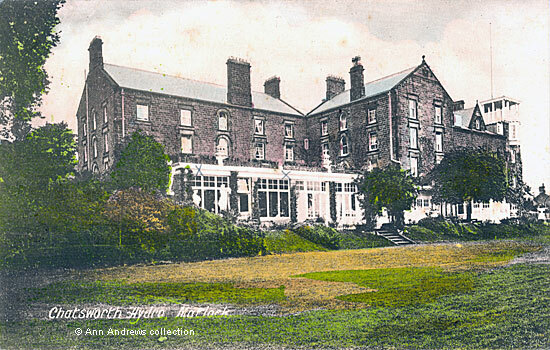 At the marriage of George Davis and Lydia Frances Frost in late 1896 it was said that three generations of Davis had been hydropathists in Matlock. The bridegroom was the only son the late Mr Jesse Davis, the proprietor the Poplar Cottage and the Prospect Place Hydropathic Establishments and the grandson of the founder and this was his second marriage. In 1900 Jeff's Poplar Hydro Co. Ltd. was registered by Charles Jeffs of Grimsby, with £7,000 capital in £1 shares to acquire Poplar Cottage Hydro. George Davis was still linked to the hydro for a while afterwards. At the beginning of the twentieth century there were numerous advertisements for Jeffs Poplar Hydro published in Yorkshire newspapers. In 1902 it was said that it "Stands in its own ground, with Gardens, Bowling Green, etc. and commands excellent views. Hot Water Services throughout, making it a splendid winter resort. No better place for persons suffering from Gout, Sciatica, Rheumatism, Bronchitis, and Diseases of the Liver, Kidneys or Respiratory Organs (over 80 per cent of cases cured)". The terms were then 5s. per day. The company employed managers to run the hydro, including Mary Williams, Miss Trolley, Charles and Alice Woods and Mr. and Mrs. Hides. When it was sold again in 1912 Jeffs Poplar Hydro Company Limited was described as "all that freehold land, situate in Chesterfield-road, Matlock, in the county of Derby, with the messuage or dwellinghouse, used as a hydropathic establishment, bathhouses, electric power house and other buildings erected thereon, known as Jeffs Poplar Hydro, and the business of a hydropathic establishment and boarding house, heretofore carried on on the above premises by the defendant company, and the goodwill and connections thereof, stock-in-trade, furniture, plate, glass, china, stores, baths, fittings and appliances, wood-constructed motor garage and other effects in and about the said house and premises. A small portion of the property is copyhold of the Manor of Matlock". 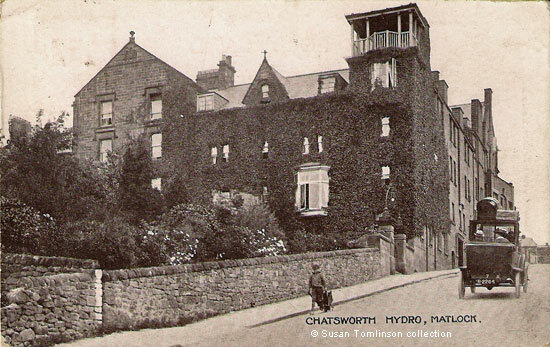 It was renamed Chatsworth Hydro, claiming in 1920 that it had "absolutely [the] finest position in Matlock" and in 1926 "the cosiest of all Hydros" advertised suites to attract permanent residents. Mr. and Mrs. Francis Taylor had been the owners for some years, with Mrs. Taylor acting as the manageress. Mr. Taylor had business interests in both Stockport and Manchester and when he died in 1928 it was said that he had been associated with Matlock Hydros for many years. His wife died less than two months later and Chatsworth was put up for auction, though did not sell immediately. By 1932 it was under both new ownership and management. Chatsworth continued as a hydro until the Second World War when C&A Modes, a Manchester textile firm, took it over (although it was still advertising as a hydro in Kelly's 1941 Directory). It reopened briefly as a hydro post war but was bought by Derbyshire County Council, along with Rockside, and a number of large houses in the vicinity. The sale was finalised seven months after the Council had bought Rockside; they paid £17,000 for Chatsworth. These buildings became the newly formed Matlock Teacher Training College, a highly respected institution in the town. Unfortunately for Matlock, the students moved to the Derby in 1988 when the Derby and Matlock Colleges amalgamated. down weather hood so that passengers sitting in the back could enjoy the view on fine days. It was possibly a taxi, registered in Derbyshire. A young boy is walking down Chesterfield Road, pulling some kind of trolley or small barrow. Matlock Bank Primitive Methodist Church, 'Young Mens' Class has pictures of some members of the Wildgoose family, who were related to the Davis family. Matlock Primitive Methodist Prize Choir also shows some of the Wildgoose family. Historical Records Names in Census returns and Trades Directories. In 1901 Grimsby Town football team were staying at Poplar Hydro on census night. Matlock: Letterheads of Local Businesses, 1900-1949 (3) - Jeffs Poplar Hydro letterheads in 1903. 1. "Chatsworth Hydro, Matlock", published by S. DAKIN, Tobacconist, Stationer, and Hair-Dressing, Smedley Street, Matlock. No. 11139. 1848. Printed in England. In the collection of, provided by and © Ann Andrews. 2. "The Chatsworth Hydro, Matlock", published by Ed. J. Burrow & Co. Ltd., Publishers, Artists, Printers, Cheltenham. Printed in Great Britain. Unused, but an identical card to this was posted in 1938. In the collection of, provided by and © Ann Andrews. 3. 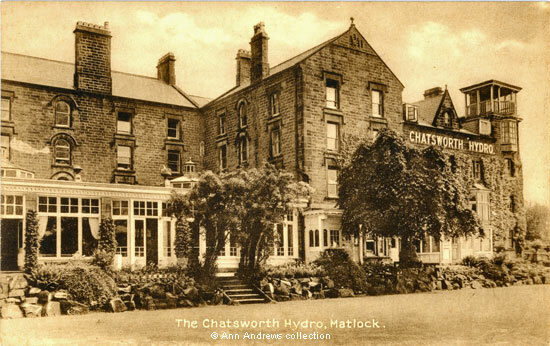 "Chatsworth Hydro, Matlock", published by A. W. Gessey, Crown Square, Matlock.Posted at Matlock on 4 Aug 1920. In the collection of, provided by and © Susan Tomlinson. Researched and written by and © Ann Andrews. Information from Ray Ash. Also see the 1891 census when Josiah Davis was at Poplar Cottage and "Kelly's 1891 Directory" listing Davis Thomas & Sons, hydropathic establishment, Prospect House & Poplar Cottage. Not on this site, but the same entry was in "Kelly's Directory 1895 "; by 1899 the entry was for Thos Davies & Sons and was just Poplar Cottage. Thomas Davis advertised in "Days in Derbyshire" (1863) by Spencer Timothy Hall. Hall also mentions the Davis brothers in Chapter 5. "Derbyshire Times and Chesterfield Herald", 5 December 1896. The couple were married at All Saints' and the reception was held at Poplar Cottage. "Sheffield Independent", Thursday 15 November 1900. "Hull Daily Mail", Thursday 3 April 1902. Jeffs Poplar Hydro, Matlock Bank. On census night in 1901 Grimsby Town football team were staying at Poplar Hydro; Mary Williams was the manageress. "Kelly's Directory, 1908" advertised Jeff's Poplar Hydro Co. Limited (Miss E. Trolley, manageress), Chesterfield road. The 1911 census showed Mr. and Mrs Woods, from Islington, were living at the hydro with their three young children. In the 1912 directory William F. and Mrs. R. Hides were shown as the managers. "The London Gazette", 17 September 1912 (notice of sale of his property). "Kelly's Directory, 1925" gives the name as Chatsworth Hydro but newspaper reports show the property had been Chatsworth Hydro from 1913 onwards. "Derby Daily Telegraph", Friday 15 October 1926: "2 or 3 Suites of rooms to let, furnished or unfurnished, for desirable permanent residents, with or without board". "Nottingham Evening Post", Monday 20 August 1928. "Manchester and Matlock have lost a well-known business man by the death yesterday of Mr. Francis Taylor". "Derby Daily Telegraph", Monday 05 November 1928. "Kelly's Directory, 1932" states that Chatsworth Hydropathic Co. Ltd was "under new ownership & management ... adjacent to golf links".